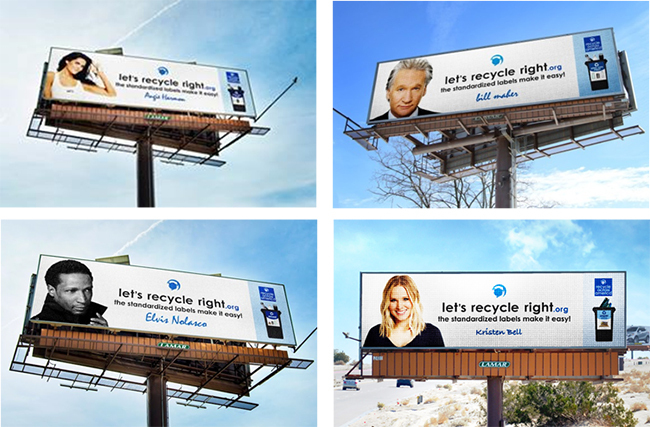 Beginning this week, Lamar billboards will begin displaying the faces of celebrities such as; Angie Harmon, Kristen Bell, Bill Maher, Elvis Nolasco, Stana Katic, AnnaSophia Robb, Ian Somerhalder and many others who are introducing the society-wide standardized labels for recycling bins to begin repairing U.S. recycling. September 15, 2015 Minneapolis, MN – Nonprofit organization Recycle Across America (RAA) announced a partnership with Lamar Advertising Company (Lamar), one of the nation’s leading out-of-home advertising companies, to promote RAA’s celebrity-led “Let’s recycle right!” campaign (Let’s) which introduces the new society-wide standardized labeling solution for recycling bins. The labeling solution has proven to help people recycle more and has proven to help people recycle right. The society-wide standardized labeling solution and the Let’s campaign are coming at a critical time when U.S. recycling levels are beginning to fall from an already low 35%, down to 33% (U.S. EPA) -- when major recycling haulers are declaring recycling unprofitable and announcing closings of their recycling processing plants. The standardized labels are a simple, commonsense solution that have proven to increase recycling levels 50-100%, while significantly decreasing the amount of ‘garbage’ that is historically thrown in recycling bins due to a confused, apathetic and often skeptical public. The millions of tons of ‘garbage’ thrown in recycling bins every day has been crippling the quality and economics of recycling, preventing many manufacturers from being able to use the materials. The donated billboard space from Lamar for the Let’s campaign, in addition to the donated TV, radio, cable and print from other leading media organizations, is already advancing the solution of the standardized labels and helping society recycle right. For instance, as a result of the pilot of the Let’s campaign, Bank of America learned about RAA and began using the standardized labels on the recycling bins in their facilities which proved to make it easier for their employees and visitors to recycle more and recycle right. Additionally, Bank of America donated 26,000 standardized labels to all the K-12 public schools in Orange County Public School District in Orlando, FL to help OCPS students and future generations begin to recycle right as well. The Let’s campaign features a host of celebrities, musicians, athletes and other influencers who are donating their time, names and voices to this solution. The Let’s campaign is now being referred to as the new “Got Milk” campaign, but for recycling. To better understand the issue, historically there have been hundred of thousands of confusing and inconsistent labels on recycling bins throughout the U.S., resulting in a confused and apathetic public, and subsequently millions of tons of ‘garbage’ are being thrown in recycling bins each day. The ‘garbage’ thrown in recycling bins is extremely costly to remove, often lessening the quality of the materials and making the commodity pricing of recycled materials more expensive than virgin materials and less desirable for manufacturers to use. In turn, this is causing the recycling industry to declare that recycling isn’t profitable and move toward closing recycling plants. The society-wide labeling solution for recycling bins is being used by thousands of K-12 schools and universities, public destinations and some of the most notable businesses and brands in the world. To date there are more than a million of RAA’s standardized labels on recycling bins throughout the U.S. Recycle Across America (RAA) is a 501(c)(3) non-profit organization, which has developed the first and only society-wide standardized labeling system for recycling bins to help eliminate the public confusion surrounding recycling and to improve the economics of closed loop manufacturing. RAA’s standardized labels have been identified as a world-changing solution by Ashoka Global Innovators for the Public and are being referred to as “one of the most important environmental fixes taking root today.” For more information about RAA’s standardized label initiative or its celebrity-led ‘Let’s Recycle Right’ campaign, visit www.recycleacrossamerica.org or contact info@recycleacrossasmerica.org.